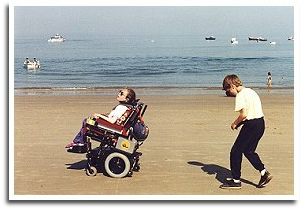 We support a local charity The Harriet Davis Trust, it provides fully equipped house's for severely disabled children to to be able to have a holiday by the seaside. Harriet Davis suffered from a rare degenerative metabolic disease ‘Leigh’s Encephalmyelopathy' it's what is known as an 'orphan' disease and was left unable to speak and had lost most of her motor abilities. Harriet died at the age of eleven and the trust was set up in 1992 as a tribute to her shining and indomitable spirit. Her Parents were very aware of the fact that suitable accommodation was hard to find, especially at an affordable price, which would enable the whole family with a severely disabled child to have a holiday. We didn't know Harriet ourselves, only through her parents John and Kit who work tirelessly. Since we became involved we have now come to know more and more about the difficulties faced by many of the children and their families in just getting by day to day. Something us able bodied don't even realise until we're faced with it. We feel it is an honour and a privilege to be a part of this very special worthwhile charity, it's run for the children and not for the profit. We look forward to many more years involvement. Please enjoy browsing the link at the top of the page for more information.